For years trailing behind other regenerated areas in the capital, these two quarters are now eager to embrace revolution. If the city centre to the north side of la Alameda tells a story marred by natural catastrophes, then the south side speaks mainly of manmade disasters. The area that aspired to match the finesse of the historic quarter has sadly ended up looking a little bankrupt. Each time that the country’s economy enjoyed a golden era, this edge of the city blossomed with new developments: palaces, parks, mansions and boulevards as grandiose as the ones built across the Alameda. But these barrios took the brunt of each economic meltdown of the 19th and 20th century, forcing big projects to be abandoned and hopes to be slowly buried in time. The history of the Barrio Dieciocho and the Barrio República is, hence, an unfinished business. These two neighbourhoods, which in their aristocratic past were deemed as the most ravishing and elite quarters of the city, can – and should – face the future with fresh ambitions. To build on the success of the Barrio Brasil or Lastarria, for example, will depend on how the new generations who now dwell, study or party in these streets exploit the potentials around them. Because potential, there’s plenty. The hidden architectural gems, the dreamy verdant streets and the top-quality facilities (green spaces, universities, museums, a race court and even a much maligned theme park) make this place very visitable and very investable indeed. Thankfully, the consciousness that something needs to be done about this now officially declared ‘conservation area’ has taken hold of Santiaguinos in recent years, and though the challenges ahead aren’t few, something tells you that these two barrios will soon start reclaiming their rightful place at the capital’s heartland. The best spot to start a tour of the area is at the Basílica de los Sacramentinos, a good testimony of Santiago’s fixation with Parisian architecture. The church is an unequivocal replica of the Sacre Coeur in Montmarte, with only slight variations in the facade. 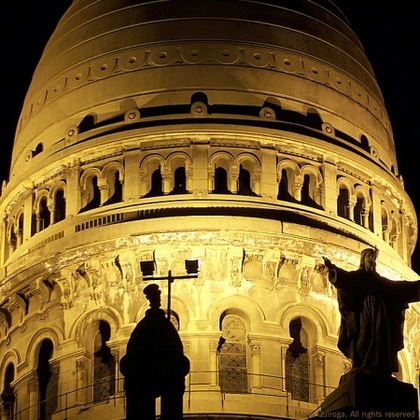 Walk through Parque Diego de Almagro to appreciate the dome in all its uncanny resemblance. The Parisian effect is quickly over, however, as adjacent Calle Santa Isabel is vastly unimpressive, as is Calle San Diego. You’re better off heading north up Calle San Ignacio, where the true architectural heritage awaits you. First, at the corner with Calle Alonso Ovalle, there’s a spectacular contrast of styles between a peculiar neo-gothic palace, some elegant neoclassical apartments and the traditional church of San Ignacio towering over the adjacent convent and school. This church was the result of the Jesuits relocating in 1899 from a now disappeared location in Calle Compañía (Compañía as in Compañía de Jesús or ‘Society’ of Jesus). Head to Barrio República for Art Nouveau galore. Venture towards la Alameda to marvel at the buildings conforming the block between Calle San Ignacio and Dieciocho. At number 1550 lies the Círculo Español or Spanish Society, once a worshipful hangout of aristocrats and now a rather unnewsworthy restaurant. The circulo still boasts an astonishingly beautiful building, with a magnificent wroght-iron gate and two dragon-shaped lanterns as the main external features. Just beside it is another of Santiago’s historic venues, the Confitería Torres. Housed in a stunning rococo building, this confitería (a local term for bistro) was for decades the capital’s most sought hunt of artists, socialites and politicians, including some of the Heads of State whose portraits decorate the walls of the bistro’s ‘Galería de los Presidentes’. The ownership of the Confitería Torres, which had been the property of the same family since 1879, changed hands in 2002 and underwent a refurbishment to enhance its classy interiors and recuperate its rusty reputation. Now a successful project, the Confitería has made a comeback as a ritzy restaurant offering the traditional Chilean cuisine that this very establishment helped defining. From the top end of Calle Dieciocho, head south through some of Santiago’s most impressive range of palaces and architectural harmony. This street, named after the national holiday of 18th (dieciocho) September, concentrates dozens of splendid buildings: some are pristinely preserved, some are painstakingly deteriorated. There are some desolated mansions of which nothing remains but the outer shell, underlying the paradox that the legal status of ‘conservation area’ has often been counterproductive in a town that owed much of its recent economic heyday to the property development boom. Speaking of economic heyday, don’t miss the mansion at the end of the road. The Palacio Cousiño deceives with its compact exterior and modestly-sized gardens, for nothing quite prepares you to the sumptuousness ad nauseam of its interior. Majolica tiles, Carrara marble, Bohemian-crystal chandeliers… you name it: the Cousiño family were a filthy rich bunch who did not look at price tags. Now turned into a museum to portray how the rich – the really rich –lived in 19th century Chile, the Palacio Cousiño is an experience you simply cannot miss. To continue the journey you’ll need to cross over the bleak Norte-Sur highway to find the Parque O’Higgins, Santiago’s largest public park. The grounds formerly known as Campos de Marte were originally a military precint that was converted into a public park in 1873 thanks to the support of the Cousiños, who hired French landscape designer Guillaume Renner to redesign the area. Unfortunately, the park’s maintenance was not to live up to Mr Renner or Mr Cousiño’s expectations; its landscpae took a serious beating over the course of the 20th century when a large portion of trees were removed to make space for some atrocious aslphalt esplanades. The 1970s saw the construction of the ridiculously out-of-place Fantasilandia, the capital’s largest theme-park. As if the screaming noise coming from the rollercoasters hadn’t been enough, authorities in the 1990s decided to add the largest music venue in South America, the UFO-looking Arena Santiago. One can only hope that the recent municipal announcement of a much-needed facelift materialises sooner rather than later. The grid of streets connecting Avenida Blanco Enclada (to the northern edge of the Parque O’Higgins) with la Alameda and the norte-sur highway with the main railway line to the west, constitute what is now commonly known as Barrio República. This is another iconic quarter of the city, a good deal greener and less traffic-ridden than the Barrio Dieciocho. Also, this barrio is undergoing a much more vigorous revival thanks to the private colleges and art institutes who’ve brought in that young atmosphere that is long gone from places like Bellavista. The area boasts a lively feel during the day, when college students reclaim the streets to socialise, drink coffee or catch up on their reading (or at least pretend to). Leafy and mansion-lined Calle República or polished Avenida Ejército are the quarter’s most popular thoroughfares. 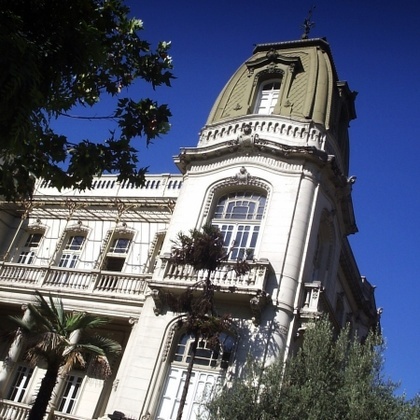 In addition to the university facilities, the area has drawn institutions like the Museo de la Solidaridad Salvador Allende, housed in a huge mansion of Avenida República. This art space has taken Santiago’s contemporary art scene by storm since its inception in 1999, as some of the world’s greatest contemporary artists like Miró, Vasarely and Picasso, made donations. The museum also holds regular exhibitions and events in addition to its 2,500-piece permanent collection.